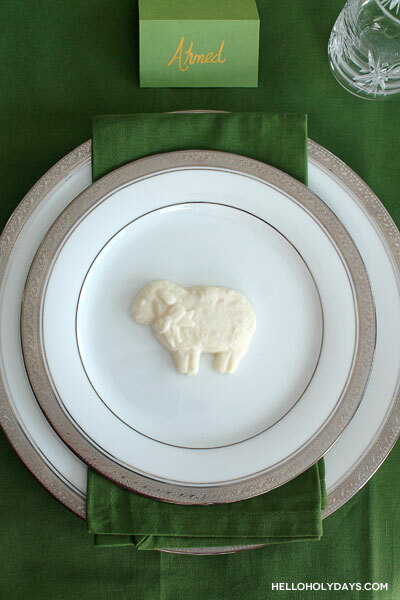 Chocolate Lamb Place Settings – Hello Holy Days! If you’re hosting dinner for Eid al Adha, greet your guests with chocolate lamb place settings. In many Muslim cultures, lamb is the choice of meat for the Eid al Adha feast, so these little chocolate lambs act as a nod to the dinner’s menu. Plus you can enjoy this place setting with dessert! If you wish to have your chocolate lambs serve as a take home favour, place the chocolates inside a clear treat bag and add a bow to match the linens. Here, green linens are used because lambs graze on green grass. As Eid al Adha is the more religiously significant of the two Muslim holidays, and green has been culturally popularized as the “colour of Islam”, the green works both literally and symbolically. For an added personal touch, make green tent cards and write the names of guests with a gold pen. Place in front of each plate.